The DTC is stored when the headlight leveling ECU assembly detects malfunctions in the rear height control sensor sub-assembly RH power source or rear height control sensor sub-assembly RH. If either of the following is performed, initialization of the headlight leveling ECU assembly is necessary (See page ). Replacement of the headlight leveling ECU assembly. Replacement or removal/installation of the rear height control sensor sub-assembly RH or work that changes the vehicle height such as replacement of suspension components. DTC B2416 is not output. (d) Enter the following menus: Body Electrical / HL Auto Leveling / Data List. Normal condition listed above is displayed. 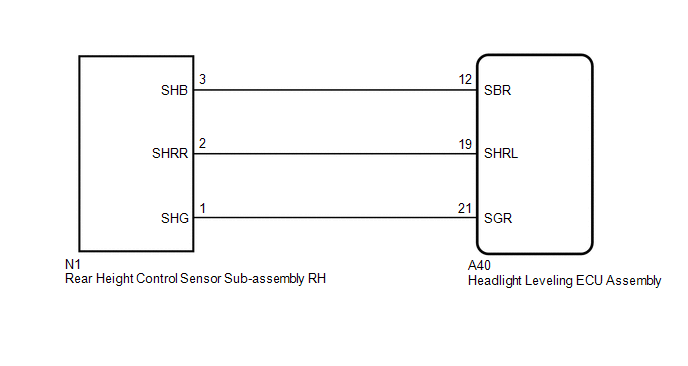 (a) Remove the rear height control sensor sub-assembly RH (See page ). (b) Inspect the rear height control sensor sub-assembly RH (See page ). (b) Disconnect the N1 rear height control sensor sub-assembly RH connector.